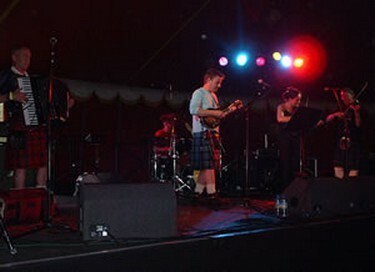 The 'Canongate Cadjers Ceilidh Band' are also available for weddings, festivals, student and all social functions as a 4/5 piece outfit. While still featuring our famed 'Full-On-Ceilidh' sets by adding guitar/mandolin and vocals we provide covers from acts including The Waterboys, Eagles & Steve Earle etc. to give an even more varied programme. Combining the best of Scottish / Irish Ceilidh music with many diverse influences from the Folk, Country, Blues, Pop and Rock world we have reached new audiences throughout the world playing at many large events including the Ceilidh tent at the 2004 ' T in the Park' festival. As you will gather from this web site we are in many ways a unique band as we offer many different combinations ranging from the traditional ' box & fiddle' duo to a 'celtic' big band. This flexibility means that we are in a position to provide exactly the best line-up required to make your event a huge success .... everytime! We think that a nights entertainment offering a mixture of traditional dances (Jigs / Reels etc) and great songs is a truely unbeatable combination.